It's time for a Cheapskates Club challenge. 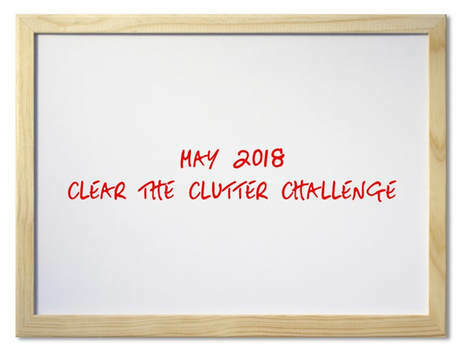 For the next 30 days the challenge is to clear the clutter. You may have a lot of clutter or you may only have a few things here and there. You may stay on top of clutter and just need to take five minutes to tidy up or you may be almost buried under clutter. There are plenty of reasons to clear clutter but the biggest is simply because clutter costs you money. When you're surrounded by clutter every task takes longer. You often can't find the things you need so you buy replacements (what a waste of money!). ​If your household is like many others you’ll find yourself asking how you accumulated so much stuff. Don't worry, you're not alone, there is clutter in households, cars, handbags, cupboards, garden sheds, and everywhere else all over the country). Holidays and birthdays come every year and we go through the rituals of buying and spending without ever really taking the time and energy to take inventory of what we already have. By taking some time and evaluating, we can learn to reuse, recycle, or just give away what no longer fits into our lifestyle. The old adage that you are a product of your environment holds especially true with your actual surroundings. If you are living amongst chaos in your work and home environment, then it stands to reason that your lifestyle will reflect that chaos. 1. Inventory - Begin to purge yourself of all the unnecessary stuff by first taking inventory. Grab a notepad and a pen and take notes as you go room by room noting what you absolutely need to keep and what you can easily part with. Look at every last detail including furniture, as there may be some pieces that can be sanded down or repainted and brought into another room for a more useful purpose. Once you have taken a good inventory, then it is time to evaluate the use of your space. 2. Evaluate – By evaluating the use of your space, you can determine what works for you and what is working against you. For example, if you have a pile of books on the floor that you have been meaning to get to for the last year, perhaps it's time to donate them. Chances are if you don't have the time or haven't made the time to read them yet, you probably won't be reading them anytime soon. If you really do desire to read, you can always go to the library and check them out one book at a time. Also, something as simple moving a piece of furniture could give you a clutter-free environment. If there is a table sitting too close to your entryway chances are it will become everyone’s catch-all where they toss their keys, school work, phones and more. Removing the table and hanging up some hooks for coats, backpacks and umbrellas would encourage everyone to put their items in the appropriate place. 3. Time to Say Goodbye – After taking inventory and doing a thorough evaluation, it is time to say goodbye. For many of us, throwing things out never feels right. Thankfully, there is always someone who can use what you have. You may have a new neighbour expecting a baby and some of your slightly used baby clothes may be more than welcome to a new parent. If you have a room with way too much furniture, perhaps a family member setting up house would be more than happy to refinish your old desk. There are also charities that are always willing and happy for your donations. Remember, one man’s garbage is another man’s treasures so if you don’t want to toss your item, find some way to donate it. Once you have taken the time to take inventory, evaluate your space, and then say goodbye to clutter, you will be saying hello to simply living - clutter free! Here are some of the wonderful ideas for clearing clutter that Cheapskaters have been sharing in the Member's forum Decluttering Tally Game thread. Find a worthy cause to give them to so the good feeling outweighs the loss. By this I mean beauty products to a women's shelter or food bank, books to a fete, magazines (if the pictures etc. are suitable) to schools or kinder for art or aged care, doctors etc. for people to read and while away the time. Ask yourself - when did you last read, look at, use this item? If it's more than say six months put it in the box to give away or donate. It's all small steps, one day at a time. With magazines, I take them to my local library and also the local aged care facility and their associated shop. Re letting go - with books, I seriously looked at each one - asked myself, have I read it, do I need it. If I wasn't sure I kept it but made sure I got rid of half of my books in that first run. Then a few months later on I did the same thing until I felt comfortable with what I kept. Slow and steady is probably best. Start with things that don't really mean anything to you or have a use; maybe start with one room and when done you will see a big difference and hopefully be able to get rid of more and more until you are comfortable with what you have left. Make a rule.... for every one thing that enters the house.... two must leave. Make a game of it! If it's fun, it's easier and it will get easier as you go along. Sentimental things...take a picture. If in doubt...have a box of Undecideds....when it is full... tape it up and leave it for six months. If you have not missed anything... then you can say goodbye easily. And my personal favourite...if you miss stuff you have sent to the Op shop...guess what...you can go there and VISIT it!!! But, and it's a big but, I'm getting emails from Cheapskaters who are swamped by the clutter in their lives. They haven't started to move, let alone clear, the clutter. They don't know where to start. Have a clear out. The first step in reducing your clutter is to go through everything in your home and get rid of what you no longer need. Many of us have far too many possessions and they can really get in the way of daily life. Give everything you don’t need to charity, this way it can be put to good use by someone who really needs it. Be ruthless in your clearing out and don’t just send things to the garage or garden shed for dealing with later, this will only delay in the inevitable. Get your kids to help too. Set up a station for different items and get everyone to pitch in and do their part. I've put a big cardboard box by the back door - you can't miss it and everyone knows what it is for this month. Have a system. Once you’ve cleared out the clutter it’s important to set up a system to keep things clutter free. Set up a place for everything. You can get economical baskets which are natural and also a great way to hide stationary, odds and ends, kids toys and everything else in between. Label everything clearly so that all members of the household know where things go. I've gone so far as to label the drawers in the kids' tall boy and the shelves in their wardrobes when they were little. It made it that much easier for them to put things away and there were no excuses for not knowing where things went. Setting up a recycling system will also help the planet and the house stay in tip top shape. Help your children get to grips with the system by clearly labelling everything and showing them where things go. Used papers can go in one basket to use as scraps for writing notes and anything unused can be recycled. Reduce the amount you buy. Not only will this help the environment, it will also help your bank account and sanity too. Really think purchases through. If it’s an impulse buy then leave it behind (remember the $100/24 Hour Rule). It’s very empowering to walk away from things you really don’t need to buy. Get your kids involved by letting them know the importance of reducing our consumption and help them think through any potential buys. Reducing the clutter in your home can be really beneficial. A clutter-free home will have a sense of renewed energy. It is also easier to keep tidy and clean a home that is clutter free. Our belongings are not an extension of us and there are many things that we don’t actually need. Decluttering the home can certainly leave you feeling refreshed and empowered. Everyone that works the 9 to 5 routine has at least a week or two of annual leave (you don't need to use all your annual leave for this type of de-cluttering) plus some personal time thrown in there somewhere. Believe it or not, taking some time out from the daily grind is a fantastic way to declutter your life. In addition, if you do not have spare time off work during your regular schedule, you can set aside one weekend out of the month, and tell everyone that it is time to declutter – you are not available. Let everyone in your family know clearly that you are going to be unavailable for one weekend out of the month to declutter your own and their lives. If anyone has an aversion to this, simply tell them to let you stick to your commitment or they can chip in and help. More than likely, they will opt to leave you to your task at hand. When decluttering your life, it is essential that you don't start out decluttering and wind up looking at old photos or worse yet, cleaning. If you are going to declutter your life, you need to start with your home and discipline yourself to just declutter and not do anything else. Start by sorting out clutter into piles. One pile needs to be for throwing out. The rule of thumb is that if you have not used it or gotten to it in six months, it is never going to happen and you can toss it out. Next, make a pile for charitable donations – items that are usable but just not for you or your family. Finally make a pile of "maybe someday". This pile is the one that needs the most attention because it is easy to keep something for future reference and never use it, or to throw something out only to find out the very next day that you needed it. Think carefully before putting too much into this pile and limit the number of items it contains. One of the most important ways to declutter your life is by getting rid of paperwork. You know it is true! Paperwork that's hanging around is the worst form of clutter there is. Make a filing system once and forget about it thereafter. Go through all your mail, toss what you don't need, and file what you do need. In this way it's out of sight and out of mind. Once you have a filing system put into place, there's no turning back. A good filing system can't be beat. Go through your stationery stash and find some coloured folders or cover ugly old ones and make some pretty labels and go to town. All you have to do after that is follow through. Making the commitment, sorting things out, and creating a filing system are three great ways to declutter your home and your life. You walk into your child’s playroom or bedroom and grimace. If you’re lucky you haven’t stepped on anything. It’s a mess and each new toy only makes the mess worse. The good news is that with a few proven tips and strategies you can declutter the toys and you and the children can enjoy a mess-free space. One of the problems with children’s toys is that they collect them like your knick-knacks collect dust. Each day seems to add a new toy to the pile. Chances are your child doesn’t play with all of those toys every day. In fact, there are probably some toys that your child hasn’t touched in months. Create a rotation. Grab a large bin, or two, and fill them with toys your child hasn’t played with recently. Tuck them away in a safe and out of the way space, you don’t want your child digging in the bin and pulling items out. Once a month, pull out a bin and put those toys in your child’s play space. Then refill the bin with the toys your child has been playing with. Then sit back and watch what happens. They’ll start playing with those tucked-away toys as if they’re brand new. Your child will experience more creative playtime, and you’ll have created a system to reduce the toy clutter in their room. There will of course be a few treasured toys that never get packed away. However, the majority of the toys should enter this monthly rotation. Create a place for everything and teach your child to put things away. The largest clutter culprits are often the small toys. Doll clothes, blocks, toy cars and action figures are problematic. Small bins can do the trick. Place a photo or label on the bin so your child knows where to put the toys back when they’re done. At the end of playtime, have a five-minute clean-up session. You might even want to create a clean-up song. Sing the song and require your child to clean up after themselves. Make it a game. Challenge them to clean up in a specified amount of time. If they beat the clock they win a prize. Sometimes children test their parents. If your child is unwilling to put their toys away, take away all of the toys that aren’t cleaned up. Stick to your word. Don’t be swayed by tears and tantrums. Children can learn at a young age to be responsible for their belongings. Finally, your child will undoubtedly outgrow toys. As they do, create a plan to get rid of them. You can donate the toys to charities. You can also resell them on eBay or Gumtree or Facebook or at consignment shops. Just like you clean out their outgrown clothes, create a system to get rid of the toys they’ve outgrown. Your home is your sacred space. By teaching your child how to organise their belongings and care for their space, you’re teaching them valuable life lessons. You’re also ensuring your child’s toy room is a safe and clutter-free place to play.